The Tokyo-based Sunwolves will be cut from Super Rugby after the 2020 season in a major blow for Japan as the nation prepares to showcase its development in the sport as hosts of the World Cup. Super Rugby will revert to a purely southern hemisphere affair of 14 teams in a round-robin format, continuing the provincial competition's contraction since an ill-fated expansion to 18 sides in 2016. The timing could not be worse for World Rugby, as the global governing body preaches a message of inclusion for emerging nations ahead of the global showpiece starting in September. However, the Japan Rugby Football Union (JRFU) were unable to "financially underwrite" the team post-2020, southern hemisphere governing body SANZAAR said on Friday. "The future of the Sunwolves will now be determined by the JRFU which has determined that Super Rugby no longer remains the best pathway for the development of players for the national team," SANZAAR CEO Andy Marinos said. The JRFU later released a statement saying negotiations had foundered on SANZAAR's demand for "a substantial amount of additional funding" from 2021, which would have had a "huge impact" on the whole of Japanese rugby. 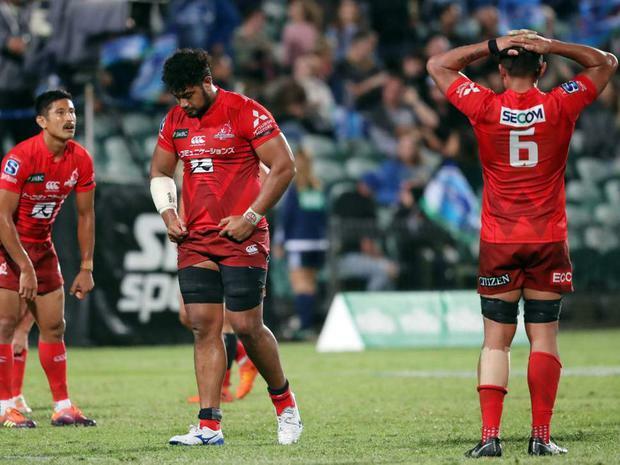 They appealed to SANZAAR to take into account the importance of the Sunwolves for the growth of Super Rugby and the increasing stability of their crowd numbers but to no avail. "We are very much disappointed with the result," said JRFU chairman Noriyuki Sakamoto. Caretaker Sunwolves coach Tony Brown, guiding the side while regular boss Jamie Joseph focuses on the national team, was reluctant to address the decision ahead of their match against the Johannesburg-based Lions on Saturday. "The game is tough enough as it is, you can't look to two years' time, you've got to look to this Saturday because we are playing a pretty good side," he told reporters in Singapore. Rugby Australia (RA) said without the JRFU's support, the Sunwolves would cost "tens of millions of dollars" to prop up. Cutting them, however, would save millions, chief executive Raelene Castle told reporters in Sydney. She said Australia and New Zealand would continue to support Japan ahead of World Rugby's proposed global Nations Championship from 2021, which would add two nations to the southern hemisphere's existing four-team Rugby Championship. The pledges may be cold comfort for the fans who flocked to Tokyo's Prince Chichibu Memorial stadium to watch Sunwolves games. "We are having the World Cup soon and we want to welcome rugby fans to Japan to see Japanese rugby. But maybe they do not want us. It is a bad message," Tokyo resident Masashi Yamashita told Reuters. With South Africa's teams complaining about travel demands, the Sunwolves agreed to play three "home" games every season in Singapore where they drew poor crowds. They claimed only three wins from their first two seasons, but survived a cull of three teams at the end of 2017 after the expanded 18-team format proved universally unpopular. Joining a re-jigged Australian conference in 2018, the Sunwolves showed improvement under former All Blacks loose forward Joseph, winning a club record three games. But with a number of their local talents signed to company teams in the domestic Top League and often diverted to extended national team training camps, the side relied largely on reinforcements from expatriate players. South Africa's powerful broadcaster SuperSports had been disappointed with the ratings the Sunwolves attracted, media reports said. Australia and New Zealand Super Rugby teams, which have landed sponsorship deals with Japanese companies, were more supportive. Sakamoto said Japanese rugby still had a bright future despite the setback. "The Rugby World Cup will be held in half a year and our players (are) aiming to reach the top eight, or higher," he added. "We have been continuing our negotiations ... to participate in the Nations Championship. There also is the Top League, which is increasing its competitiveness every year. "We strongly believe that Japan Rugby will further develop more than ever in the future." Jack Rathborn Toulouse will pay tribute to the Notre-Dame cathedral with a logo on their shirts for the Champions Cup semi-final against Leinster this weekend.